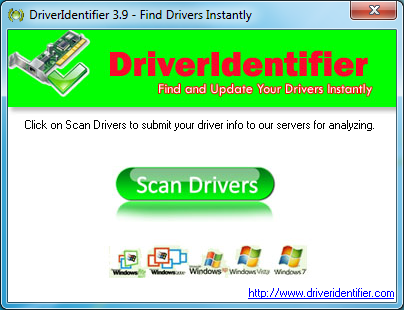 DriverIdentifier is a simple tool which aims to quickly locate any available driver updates for your PC. The program's desktop component is basic in the extreme, just a tiny window with a "Scan Drivers" button. Click this and then watch as the program scans your hardware, identifies each device and then checks the information against a central database. Once the process is complete, DriverIdentifier will then open a browser window with a list of all your current drivers, including the device name, manufacturer, version number and date. Download links are included where available, and those with updates on offer will be placed at the top. There are no options to filter or sort the driver list yourself, unfortunately. And you don't have a global "download all updates" option, either. So if your PC is seriously outdated then you'll need to manually click each Update link in turn, check the list of possibilities, download the right one for your system and install it yourself. Still, DriverIdentifier isn't bad for a free tool. Its simple nature does at least keep the program lightweight (it required only 2.56MB disk space on our test PC), and it's fine for running occasional checks just to make sure that your key drivers are still up-to-date. Please note, we've seen reports that Driverdentifier installs a browser toolbar by default. Version 3.9 didn't when we tried it, but as with all free PC tools, if you see a "Custom" or "Advanced" option during setup then always choose it, just to make sure that you've got complete control over exactly what you're installing. It's not exactly packed with features, but DriverIdentifier still provides a simple way to identify outdated drivers and download the latest versions.